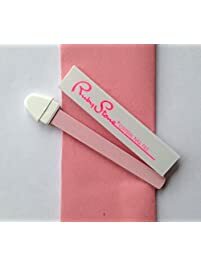 Hello today we're going to talk about the bona fide beauty nail file it's a glass file just want to show you the box that it came and I took it out. It's Muslim it was packed a little bit better than what it is now but it came in this nice box. It was nicely protected and it is wrapped in bubble wrap as you can see like I said I took it out. It wasn't acting a little better I just wanted to show you how it was protected when you got us you have to worry about it breaking but of course you never know what FedEx or UPS is going to do I don't know if you can see this on the white background I should have thought we use a different color but it comes in a nice little case a little plastic case it's beautiful like the blue is really pretty there's some different texture to it I've never had a glass file. This is my first alright. As you can see I have gel nails these aren't my own I just want to show you. This is what i normally file of like don't laugh it looks really really good. This is from wood carving and it works good to get the gel nails down i do shape them in between because they kind of get a little rounded they don't run like that. I do need to shape them now now i want to have to because i have this this works really really good I used to just a little bit and it shaped him really well it wasn't sure if it would shape them or not it doesn't feel like it would do much it doesn't feel like it has a strong grip to it or anything but yeah it works really good like anybody really wants to sit here and see me file my nails but i just wanted to show you that it does work on gel. I know it's not going to tear them up it isn't going to be any worse than anything else. 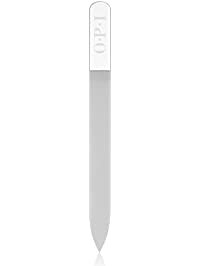 It's really pretty really classy looking I don't know how well it would stand up to a drop just keep it away from your kids really neat thing very pretty very classy very elegant very girly and it works well with jumping.